Measurements: 4.25 x 5.5 inches; or 108 x 140 millimeters. Back of card: Block print (black on white) showing four hands holding a pentacle, sword, wand & cup. Does not contrast well with front of card. Book included: Yes, 208 pages, 4.25 x 5.5 inches; or 108 x 140 millimeters. Comments: Inspired by many spiritual traditions, including Celtic, Native American, East Indian, African & Medieval European. 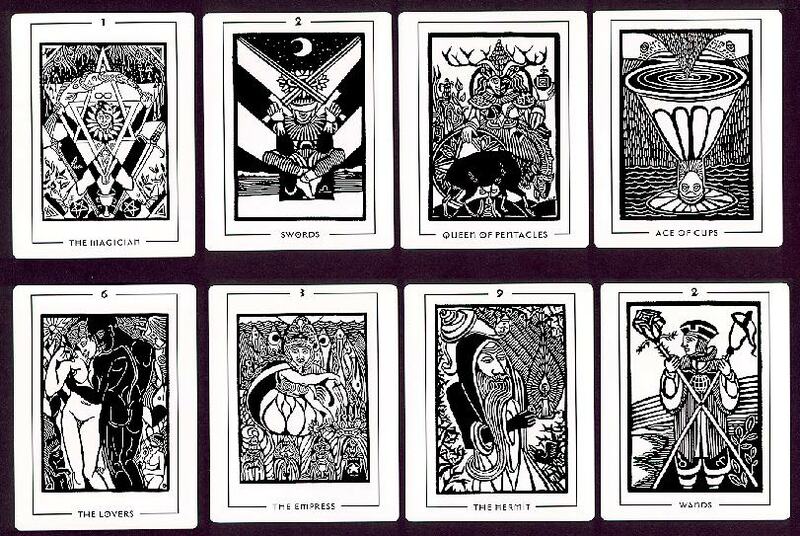 The black & white images stress contrast & balance, resolution & completion while retaining strong & workable ties to the traditional Tarot. Permeated with images of strong women, the deck also provides a welcome balance between the male & female principles. The accompanying text includes a detailed interpretation of each card & serves as an excellent introduction to the tarot. - Notes adapted from the back of the box.